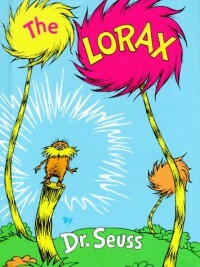 The Lorax is a classic Dr. Suess book perfect for teaching children to be eco friendly! The main characters are a mysterious person they call the Once-ler, and a strange creature named the Lorax who watches over the land and speaks out when he sees it being mistreated. The Once-ler begins to chop down the trees in the land to make thneeds. But as his business thrives, the environment suffers. All of the animals that once lived there, run out of resources to live on and are forced to leave. The air becomes so dirty the birds can't sing, and the water that the humming fish once swam in becomes extremely polluted and unfit for them to live in. In the end, the Once-ler chops down all of the trees n the land and there are none left to make any more thneeds. His business dies out and all he is left with a destroyed strip of land. This book would be great for a lesson on the environment, and what could happen if we mistreat and abuse it. This book would be great to teacher students about air pollution, water pollution and deforestation, and how it effects the environment and all the creature that inhabit it.